I taped a square of foil down to the table and F immediately looked interested. He’s only just discovered foil so this really caught his eye. We started with little dollops of paint dotted all over the foil. He cautiously dabbed the paint around. When he realised that the paint really glided, he got stuck in with both hands. He paint all mixed in together but didn’t seem to form that sludgy brown colour that it does on paper! This is definitely a “process over product” activity, as the finished artwork on foil isn’t really anything frame-able. However, we found that you can take prints by pressing paper onto the painted foil, which led to some interesting artwork! F liked it so much that we did this activity again the next day! 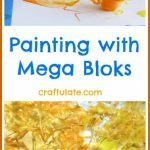 This is such a lovely art activity for toddlers to try – they’ll love how different it feels from finger painting on paper! What a fun idea! I love how the print turned out. Found your blog through Tuesday Tots.